Effective January 1st 2018, Cove Property Management assumed management of Towson Woods Apartments, 168 apartments located on Kenilworth Ave, directly across the street from the newly renovated The Shops at Kenilworth and Trader Joes. 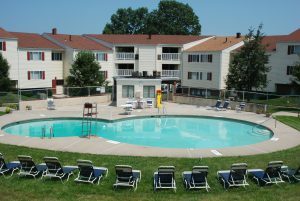 In the heart of Towson, the spacious apartments of Towson Woods offer a combination of comfort and convenience unparalleled in the area. With fully equipped kitchens, enormous walk-in closets and inviting private balconies, Towson Woods is where college students and working professionals alike can feel at home. When you’re not lounging on the sundeck by the sparkling pool or playing with your pets, you can enjoy the wealth of shopping and dining that’s well within walking distance. And, with easy access to the Beltway and the Jones Falls Expressway you’ve got the freedom and convenience to see the best of what the area has to offer. Come for a visit and let us show you why Towson Woods has the best pet friendly apartments in Towson.